Two USFWS Migratory Birds Division staff members, Craig Watson and Caleb Spiegel joined International Plover Census Coordinator, Elise Elliott-Smith (USGS Forest & Rangeland Ecosystem Science Center) to complete the first ever comprehensive plover and shorebird census in the Turks and Caicos. 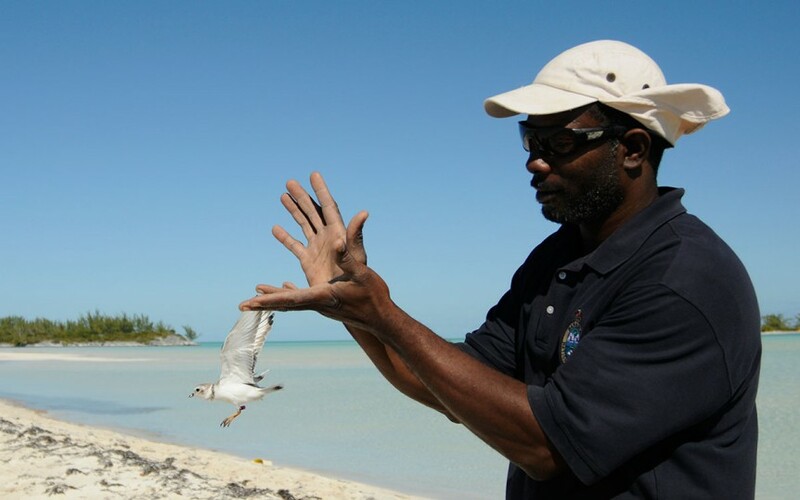 The census (January 27 – February 4, 2016) covered over 14 islands and islets determined to be promising shorebird habitat by the survey team and staff from the Turks and Caicos Department of Environment and Maritime Affairs (DEMA). Additional planning assistance was provided by Birds Caribbean, the Royal Society for Protection of Birds, and National Audubon Society. 97 Piping Plovers located, including three banded birds which were identified as having been tagged on breeding grounds in New Brunswick, Canada, Rhode Island, and Massachusetts. Fewer than 10 Piping Plovers had previously been recorded in the TCI. Over 3,200 shorebirds of 17 species were documented, including several priority species of the Atlantic Flyway Shorebird Initiative (AFSI). The census will help identify important shorebird wintering areas and associated threats as a first step in protection. The survey team covered a lot of ground, though much excellent shorebird habitat remained un-surveyed due to time constraints. We expect that many more Piping Plovers and other shorebirds would be discovered with additional surveys. Local biologists in the TCI were excited about the discovery of US Federally threatened and other priority shorebirds on undeveloped/minimally developed islands with temporary or no protection. Presence of these species can be used to make the case for longer-term or permanent habitat protection of islands which face strong development pressures. Field work with DEMA staff and training of local biologists in shorebird identification, which will help facilitate additional shorebird surveys. Presentation and discussion about the census, shorebird conservation, and AFSI given by Elise, Craig, and Caleb at DEMA Headquarters. Attendees included DEMA staff members (including the DEMA Assistant Director), representatives of local and international conservation groups including Turks & Caicos National Trust (http://tcnationaltrust.org/) and SWA Environmental Consultants, and the general public. Outreach to the School for Field Studies (http://www.fieldstudies.org/tci), a Marine Resources Study Abroad program for university students from several countries, located on South Caicos. The program now plans to initiate projects focused on shorebird research and conservation with interested students. Elise, Craig, and Caleb will provide advice on development of these projects.